The trouble is, he’s not sure he can go through with the job, blackmail or no blackmail. The actress lined up to star in the film, Thistle Downing, is an ex-child star who now lives alone in a drug-induced stupor, destitute and uninsurable. This movie would be scandalous fodder for tabloids around the country. Junior knows what he should do—get Thistle out and find her some help—but doing the right thing will land him on the wrong side of some scary people. Timothy Hallinan is the Edgar- and Macavity-nominated author of thirteen widely praised books, including The Fear Artist, Crashed, Little Elvises, and The Fame Thief. After years of working in Hollywood, television, and the music industry, he now writes fulltime. He divides his time between California and Thailand. "If you're looking for a mystery with a fresh new hero then you'll want to run right out and get this book. It's just fabulous. If you have a plane to take, then this is the book to grab." 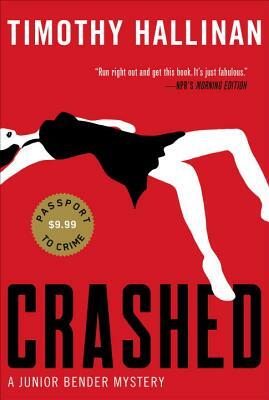 "Loved loved loved Crashed, Tim Hallinan's first Junior Bender mystery. Great narrative voice, complex plot, 3-D characters. Hallinan’s deft comic tone and colorful characters have earned him comparisons to Donald Westlake and Carl Hiassen. Check it out now." "A fresh turn on Raymond Chandler... In Crashed, Hallinan's fabulously convoluted, wise-guy detective potboiler featuring Bender, the California author's voice — intelligent, sarcastic, profane but never coarse, unfailingly honest — is like a fast ride over a potholed road in a vintage Cadillac." "The story is well designed and well told, and the dialogue sparkles. In a genre perhaps slightly overstuffed with crook-heroes, the book is like a breath of fresh air." "This fast-paced first in a series is great fun." "Hallinan builds a believable plot, filled with both humor and pathos." "This detective potboiler with its oddball characters will keep you chuckling."